Find out more at Goodyear. Sweepstakes is open to U.S. citizens and U.S. resident aliens who are physically located in and legal residents of one of one of the 50 United States or the District of Columbia who are at least 18 years of age (19 in Alabama and Nebraska, 21 in Mississippi) at time of entry. Sweepstakes commences at 12:00 AM ET on June 5, 2017 and ends at 11:59 PM on July 31, 2017. 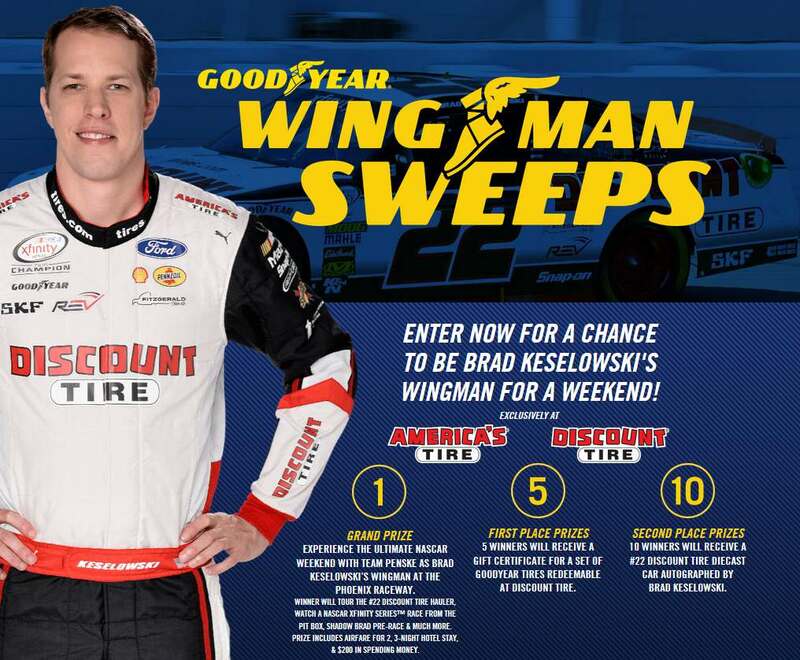 Subject to Official Rules at https://goodyear.securedpromos.com/wingmansweeps/rules . For method of entry and prize descriptions see Official Rules. Msg & data charges may apply. Odds of winning depend on number of eligible entries received. Sponsor: The Goodyear Tire & Rubber Company, 200 Innovation way, Akron, Ohio 44316 NASCAR, Inc., and Comcast Cable, Inc., are not sponsors of this promotion. NASCAR® is a registered trademark of the National Association for Stock Car Auto Racing, Inc. The NASCAR Xfinity Series™ logo and word mark are used under license by National Association for Stock Car Auto Racing, Inc., and Comcast Cable, LLC. 1. Entry Period: The “Goodyear Wingman Sweepstakes” (“Sweepstakes”) commences at 12:00 AM ET (“Eastern Time”) on June 5, 2017 and ends at 11:59 PM ET on July 31, 2017 (“Sweepstakes Period”). The Sponsor’s time clock will be the official time keeping device for this Sweepstakes. All entries must be received by 11:59 PM ET on July 31, 2017. All interpretations of these Official Rules and decisions made by Sponsor relating to the Sweepstakes are final. 2. Eligibility : The Sweepstakes is open to U.S. citizens and U.S. resident aliens who are physically located in and legal residents of one of the 50 United States or the District of Columbia who are at least the age of majority in their state of residence at time of entry: 18 years of age in most states, 19 in Alabama and Nebraska, 21 in Mississippi. Employees, agents, directors of The Goodyear Tire & Rubber Company (“Sponsor”), and The Marketing Arm Inc. (“Administrator”), and their respective parent companies, affiliated companies, subsidiaries, partners, dealers, manufacturers, distributors, sponsors, advertising agencies, promotion and administration agencies and any entity which is involved in any aspect of the creation, production, operation, execution or fulfillment of the Sweepstakes (“Sweepstakes Entities”), NASCAR, Inc., and their immediate families (i.e., parents, spouse, siblings, children, grandparents, step parents, step children and step siblings, and their respective spouses, and those living in the same household, whether or not related) are not eligible to enter Sweepstakes. By participating in this Sweepstakes, entrants: (a) agree to be bound by these Official Rules and by the interpretations of these Official Rules by Sponsor and by the decisions of Sponsor; (b) acknowledge compliance with these Official Rules; (c) represent and warrant that he or she meets all the eligibility criteria set forth in these Official Rules; (d) agree to comply with any and all applicable federal, state and local laws, rules and regulations; (e ) acknowledge that Sweepstakes is in no way sponsored, endorsed, administered by, or associated with Twitter or NASCAR, Inc.,; and (f) agree to indemnify and hold harmless Sweepstakes Entities, Twitter and Discount Tire, Penske Racing South, NASCAR, Inc., Comcast Cable, Inc., and Brad Keselowski (collectively “Released Parties”). from and against any and all liability arising out of or relating in any way to entrant’s participation in Sweepstakes and to release all rights to bring any claim, action or proceeding against Sweepstakes Entities, Twitter and Released Parties. This includes, but is not limited to, any and all claims, demands, damages and causes of action for personal injuries or death and/or damage to personal or real property, theft, loss or any other harm, suffered directly or indirectly from entrant’s participation in Sweepstakes or the receipt or acceptance, redemption, possession, use or misuse of the Prizes (hereinafter defined), and for any claim including claims based on defamation, publicity rights, invasion of privacy, copyright infringement, trademark infringement, or any other intellectual property related or other cause of action. 3. To Enter: Visit www.goodyearwingman.com and complete all required fields on the online entry form, agree to the Official Rules and submit as requested and receive one (1) entry into the Sweepstakes. Only fully completed entry forms are eligible. Message and data rates may apply if entrant enters Sweepstakes via mobile device. For an Additional Entry : Entrants can receive one (1) additional Sweepstakes entry after registering for the Sweepstakes as specified above and then by sharing their Sweepstakes entry via Twitter. Instructions on how entrant can share their Sweepstakes entry via Twitter will be included on the Sweepstakes online entry form. There is a limit of one (1) online entry per person per each day of the Sweepstakes Period and one (1) additional entry associated with each online entry per each day of the Sweepstakes Period. A “day” is defined as the twenty-four (24) hours between 12:00 AM and 11:59 PM on the same day. There is a limit of one (1) Prize per person. If it is suspected that an entrant submits more than one (1) online entry per day, only one (1) online entry will be considered for that day. In the event of a dispute over who submitted a winning online entry, the “authorized account subscriber” of the e-mail account used to participate in Sweepstakes at the actual time of entry, will be deemed to be the entrant. It is the sole responsibility of the entrant to notify the Administrator in writing if the entrant changes his or her email address during the Sweepstakes Period. The “authorized account subscriber” for online entries is defined as the natural person who is assigned an e-mail address by an Internet access provider, online service provider or other organization that is responsible for assigning email addresses for the domain associated with the submitted e-mail address. In the event a winning account selected is a joint account, a total of one (1) Prize will be awarded in the name of the first-named account holder. Proof to Sponsor’s satisfaction of being the authorized account subscriber may be required by Sponsor. All entries submitted in compliance with these Official Rules and not disqualified are considered “Eligible Entries”. All entries become the sole and exclusive property of Sponsor. Proof of entry will not be deemed to be proof of receipt of entry by Sponsor. Grand Prize : The one (1) Grand Prize Winner will receive a trip for the Winner and one (1) guest of Winner (“Guest”), to a NASCAR®-sanctioned race weekend (“Event”) at Phoenix International Raceway in Avondale, AZ (“Destination”) on November 11 – 12, 2017, but subject to change in Sponsor’s sole discretion. The trip will include: (i) round trip coach class air transportation for Grand Prize Winner and Guest which shall originate from an airport of Sponsor’s choice near Grand Prize Winner’s primary residence to Destination, with an approximate retail value (“ARV”) of $1,500; (ii) round trip ground transportation for Grand Prize Winner and Guest, to be taken together, between hotel and airport, with an ARV of $350; (iii) three (3) nights hotel accommodations in Destination for Grand Prize Winner and Guest, which will be one (1) standard room based on double occupancy (meals, telephone calls, tips, gratuities, and other incidentals and costs are not included), with an ARV of $1,150; (iv) two (2) VIP experiences good for both days of Event, with an ARV of $1,000; (v) two (2) VIP access to the NASCAR Xfinity Series™ race taking place during Event, with an ARV of $944; (vi) two (2) VIP access to the NASCAR(R)-sanctioned race taking place during Event, with an ARV of $140; (vii) one (1) $200 prepaid card for Grand Prize Winner (subject to the terms and conditions of prepaid card), with an ARV of $200; and (viii) $1,585 issued in the form of a check in the Grand Prize Winner’s name which may be used by the Grand Prize Winner to offset his or her income taxes (or a portion of his or her income taxes) incurred when accepting the Grand Prize (Should the Grand Prize Winner’s income taxes be higher than the $1,584, Sponsor and Administrator are not responsible for the difference between actual income taxes incurred), collectively the (“ Grand Prize”). The total ARV of the Grand Prize is $6,869. Sponsor reserves the right to substitute ground transportation in lieu of air transportation if the Grand Prize Winner resides within 100 miles of Destination and no compensation or substitution will be provided for the difference in Grand Prize value. Grand Prize Winner and Guest must travel on the same itinerary. Choice of ticket seat locations to be determined by Sponsor in its sole discretion. Grand Prize Winner understands and agrees that Sponsor and/or Administrator have the right, at their sole discretion, to disqualify and remove the Grand Prize Winner and Guest from any activity at any time without compensation if such person’s behavior at any point is uncooperative, disruptive, or may or does cause damage to person, property, or the reputation of Sponsor or Administrator or otherwise violates the policies of the Sponsor. First Place Prizes: Each of the five (5) First Place Winners will receive one (1) gift certificate for a set of Goodyear tires redeemable at Discount Tire, with an ARV of up to $1,000 (subject to the terms and conditions of gift certificate and with a two (2) year expiration), with an ARV of up to $1,000, the (“First Place Prize”). If the Goodyear tires redeemed are valued at less than $1,000, the Winner will not be awarded the difference in value between the $1,000 and the actual value of the tires redeemed. Second Place Prizes: Each of the ten (10) Second Place Winners will receive one (1) NASCAR® Officially Licensed, diecast autographed car sculpture (Dimensions – 10.5” x 5.25” x 4”), with an ARV of $199.99, the (“Second Place Prize”). The Grand Prize, First Place Prizes and Second Place Prizes will hereinafter collectively be referred to as (“Prize” or “ Prizes”). The total ARV of all of the Prizes is $13,868.99. The ARVs are subject to change based on current market conditions at time of Prize fulfillment, and the time of travel and the distance between departure and Destination for the Grand Prize Winner. Any difference between the ARVs and the actual values, if any, will not be awarded. 7. Winner Selection and Notification: There will be sixteen (16 ) Winners selected in a random drawing from among all of the Eligible Entries on or about August 11, 2017, by Sponsor’s independent judging agency, Administrator. Administrator will attempt to contact the potential Winners via the telephone number provided at time of entry and by entering the Sweepstakes the entrant hereby grants permission to be contacted via telephone. No messages will be left on answering machines or voicemail systems . If a potential Winner cannot be reached directly and/or does not meet the eligibility requirements, the potential Winner will be disqualified and an alternate potential Winner will be selected in a random drawing from among all of the remaining Eligible Entries. 8. Winner Verification: To be eligible to be declared a Winner and to receive the Prizes, the potential Winners must sign and return to Sponsor and/or Administrator, within three (3) days of issuance of such documentation from Administrator or Sponsor a complete and valid IRS Form W9 when required, and an Affidavit of Eligibility and Release that: (a) releases Sweepstakes Entities, Twitter and Released Parties from any and all liability, loss, claims, demands, and causes of action for personal injuries or death and/or damage to personal or real property, theft, loss, or any other harm suffered directly or indirectly from potential Winner’s participation in Sweepstakes, including, but not limited to, traveling to, preparing for and/or participating in any Prize related activity, or the acceptance, possession, or use or misuse of any Prize; (b) except where prohibited by law, grants Sweepstakes Entities the right to use potential Winner’s name, picture and/or likeness, or biographical information or voice for trade, advertising and publicity purposes, in any media now known or hereafter devised, throughout the world, in perpetuity, without additional compensation or consideration or notification; and (c) any other release or waiver deemed necessary. Entry into Sweepstakes constitutes agreement to sign such release. If potential Winners do not sign this release and return it within the time frame specified, the potential Winners may be disqualified and the Prizes forfeited. When such documentation is properly executed and providing potential Winners are otherwise in compliance with the Official Rules, potential Winners will each be determined to be a Sweepstakes winner (“ Winner” and collectively “Winners”). Guest participating in Grand Prize with Grand Prize Winner will also be required to sign [the Guest’s parent or legal guardian if Guest has not reached the age of majority in the jurisdiction in which they reside (“ Minor”)], a Liability/Publicity Release that must be returned along with the potential Winners documentation as provided in these Official Rules within three (3) days of issuance. If any Guest is a Minor, he or she must be accompanied by his or her parent or legal guardian and such parent or legal guardian must be the Grand Prize Winner. If Grand Prize Winner chooses not to take a Guest or if any Guest does not sign the documentation as provided in these Official Rules within the time frame specified then the Guest elements of the Grand Prize will be forfeited and the other elements of the Grand Prize shall constitute full satisfaction of Sponsor’s obligation to award the Grand Prize. Grand Prize Winner and Guest agree to comply with all venue rules and regulations and agree not to act in an unsportsmanlike or disruptive manner. Winner must also complete any additional legal documents provided by Administrator or Sponsor with respect to the Prizes and return them as instructed within the time frame specified or Winner may forfeit Prizes at Sponsor’s sole discretion. If a potential Winner is unable to participate in or accept the Prize or any portion of the Prize for any reason, Sponsor and the Released Parties will have no further obligation to the potential Winner. Prize or Prize documents returned as undeliverable will result in forfeiture of Prize. Sponsor expressly reserves the right to delay the announcement of the Winners for any reason Sponsor deems necessary. In addition, Sponsor reserves the right to select an alternate Winner in the event that any potential Winner fails to comply with these Official Rules or fails to execute the documentation within the time frame specified. By participating in Sweepstakes, Winners and Guest acknowledge that the Released Parties and Sweepstakes Entities have not and will not obtain or provide insurance of any kind relating to the Prizes and that Winners and Guest will be responsible for obtaining and paying for any form of insurance relating to the Prizes that Winners or Guest deem appropriate. 9. Prize Terms: The dates for fulfillment of the Prizes will be on or about August –November 2017, but subject to change in Sponsor’s sole discretion. If for any reason any Prize is unavailable or any Prize or related event is delayed, cancelled or postponed, or for any other reason, Sponsor reserves the right to modify the Sweepstakes in its sole discretion and award a substitute Prize, or portion of Prize, of comparable or greater value as set forth in these Official Rules. No substitution, transfer, assignment or cash equivalent of the Prize, or any portion thereof, is permitted by a Winner or a Guest. The Released Parties and Sweepstakes Entities shall have no responsibility or obligation to a Winner or a Guest who is unable or unavailable to, or who does not for any reason, accept or utilize the Prizes. All costs and expenses not specifically listed above as part of the Prizes, including, without limitation; passports or other travel documentation, transportation (unless specified as being included), meals, snacks, beverages, mini-bar, entertainment, tips, gratuities, souvenirs, personal expenses, damages to hotel rooms, baggage fees, travel insurance, departure taxes and fees, and any equipment to be used in connection with the Prizes, are solely Winner’s responsibility. The Grand Prize Winner may be required to provide a credit card to the hotel to cover any incidental costs incurred.PRIZES ARE PROVIDED “AS IS”. ENTRANTS ACKNOWLEDGE THAT THE RELEASED PARTIES AND SWEEPSTAKES ENTITIES HAVE NEITHER MADE NOR ARE IN ANY MANNER RESPONSIBLE OR LIABLE FOR ANY WARRANTY, REPRESENTATION OR GUARANTEE, EXPRESS OR IMPLIED, IN FACT OR IN LAW, RELATIVE TO THE PRIZES AND ANY IMPLIED WARRANTY OF MERCHANTABILITY OR FITNESS FOR A PARTICULAR PURPOSE. Prizes pictured in online, television, print advertising, and other Sweepstakes materials are for illustrative purposes only. Arrangements for the fulfillment of the Prizes, including all travel arrangements, will be made by Administrator and/or Sponsor. Sponsor will determine in its sole discretion the airline and hotel to be provided as part of the Grand Prize. All travel dates are subject to change in Sponsor’s sole discretion. If Grand Prize Winner is not available or able to travel on the dates specified by Sponsor, Grand Prize Winner and Guest’s privileges will be terminated and an alternative Grand Prize Winner will be selected in a random manner from the remaining Eligible Entries if time permits. Travel restrictions, conditions and limitations may apply. Travel arrangements are subject to availability and must be roundtrip. The Released Parties and Sweepstakes Entities shall not be responsible for any damage to baggage or any cancellations, delays, diversions or substitutions or any acts or omissions whatsoever by the air carriers, hotels or other transportation companies or any other persons providing any element of the Grand Prize or associated with the Grand Prize. Grand Prize Winner and Guest must possess valid travel documents in order to travel. 11. General Terms: Sweepstakes Entities, Twitter and Released Parties are not responsible if Sweepstakes cannot take place, or if any Prize cannot be awarded due to delays, interruptions or failures due to acts of God, war, natural disasters, weather, acts or threats of terrorism, strikes, lockouts, labor disputes, work stoppages, fire, acts of government, or other events outside of the reasonable control of the Released Parties and Sweepstakes Entities. If, for any reason Sweepstakes is not capable of running as planned, including, without limitation, infection by computer virus, bugs, tampering, unauthorized intervention, fraud, technical failures, or any other causes beyond the reasonable control of Sweepstakes Entities and the Released Parties, which, in Sponsor’s sole determination, corrupts or affects the administration, security, fairness, integrity or proper conduct of this Sweepstakes, Sponsor reserves the right, in its sole discretion, to cancel, terminate, modify, or suspend Sweepstakes or any part of the Sweepstakes. If Sweepstakes or any part of the Sweepstakes is terminated or modified prior to the closing date of the Sweepstakes, notice will be posted on https://goodyear.securedpromos.com/wingmansweeps if time permits and the Prizes will be awarded to Winners to be selected in a random drawing from among all of the remaining uncorrupted Eligible Entries received prior to any such event, or in any manner that is fair and equitable as determined by Sponsor in its sole discretion. Sponsor reserves the right to modify and amend these Official Rules from time to time during Sweepstakes for clarification purposes. Failure by Sponsor to enforce any term of these Official Rules shall not constitute a waiver of that provision. Sweepstakes Entities and the Released Parties assume no responsibility for and will disqualify entries that are: stolen, late, lost, illegible, incomplete, invalid, unintelligible, altered, tampered with, unauthorized, fraudulent, damaged, destroyed, delayed, misdirected, not received, postage due mail entries, or that have incorrect or inaccurate entry information, whether caused by any of the equipment or programming associated with or utilized in the Sweepstakes, or by any human, mechanical or electronic error that may occur in the processing of the entries in Sweepstakes, or other errors appearing within the Official Rules or in any Sweepstakes related advertisements. Sweepstakes Entities and the Released Parties assume no responsibility for any typographical or other error in the printing of the offer, administration of Sweepstakes, errors in processing entries, identifying the Winners, in the announcement of the Prizes and Winners, and the delivery of the Prizes, any problems or technical malfunction of any telephone network or lines, mobile phone, computer systems, online systems, servers or providers, computer equipment, software, failure of any e-mail or players on account of technical problems or traffic congestion on the Internet or on any web site, or any combination thereof, including, without limitation, any injury or damage to entrant’s or any other person’s computer system/software or mobile phone or other portable electronic device related to or resulting from participation or downloading any materials in Sweepstakes. Use of any device to automate or subvert entry is prohibited and any entries received by such means will be void. No software-generated, robotic, programmed, script, macro or other automated entries are permitted and any entries received by such means will be void. Sponsor reserves the right in its sole discretion to disqualify any person they suspect or find: (i) to have used a software generated, robotic, programmed, script, macro or other automated entry; (ii) to have tampered with the entry process or the operation of Sweepstakes; (iii) to be acting in a disruptive manner, or with the intent to annoy, abuse, threaten or harass any other person; (iv) to display behavior that will bring such Winner, the Released Parties or Sweepstakes Entities into disgrace; (v) to have provided inaccurate information on any legal documents submitted in connection with Sweepstakes; or (vi) to be acting in violation of these Official Rules. ANY VIOLATION OF THESE OFFICIAL RULES BY A WINNER WILL RESULT IN SUCH WINNER’S DISQUALIFICATION AS A WINNER OF THE SWEEPSTAKES AND ALL PRIVILEGES AS A WINNER WILL BE IMMEDIATELY TERMINATED. IN THE EVENT ENTRANT ATTEMPTS TO BRING A CLAIM, ACTION OR PROCEEDING AGAINST SWEEPSTAKES ENTITIES OR RELEASED PARTIES DESPITE AGREEING NOT TO DO SO IN SECTION 2 OF THESE OFFICIAL RULES, As a condition of entering the SweepstakeS, Entrant agrees that: (i) under no circumstance will Entrant be permitted to obtain awards for, and Entrant hereby waives all rights to claim, punitive, incidental, consequential or any other damages, other than for out-of-pocket expenses; (ii) ENTRANT WAIVES THE RIGHT TO A JURY TRIAL OF ANY AND ALL ISSUES AND THAT all causes of action arising out of or connected with this SweepstakeS, or any prize awarded, shall be resolved individually — without resort to any form of class action — by BINDING arbitration (by a single neutral arbitrator selected by Sponsor in its sole and absolute discretion) ; and (iii) any and all claims, judgments and awardS shall be limited to actual out-of-pocket costs incurred, but in no event SHALL SUCH CLAIMS, JUDGMENTS OR AWARDS INCLUDE attorneys’ fees. This sweepstakes shall be governed by and construed in accordance with the laws of the state of OHIO. 12. Request for Names of Winners and Official Rules: All requests for a copy of the Official Rules and for the names of the Winners (first name and state) must be made by October 2, 2017. Vermont residents may omit return postage if requesting a set of Official Rules. For the names of the Winners and/or Official Rules: (i) send a self- addressed stamped envelope to: The Marketing Arm Inc., Attention “Goodyear Wingman Sweepstakes”, #140 233 Rock Road, Glen Rock, NJ 07452; and (ii) write, as applicable, “Winners List” or “Official Rules” on the lower left hand corner of the envelope. This Sweepstakes is in no way sponsored, endorsed or administered by, or associated with Twitter. NASCAR, Inc., or Comcast Cable, Inc.